This was one of the first name plaques I created. The plaque depicts a miniature summer flower garden and a little girl watering the flowers. I used plywood as a base layer of this plaque. The plywood was finely sanded and then painted. The decorations were made from the eco-friendly felt and were glued to the plywood with the high quality craft glue. The name plaque has an attached ribbon that can be used to hang the plaque on a wall or a door. This plaque is personalized with the name. The name in the pictures is for the demonstration only. If you would decide to purchase this name plaque, you would need to tell me the name you want to appear on this plaque. This plaque is sold as made-to-order which means that you will not be receiving the item that is displayed in the pictures. The item you will be receiving will be another plaque that will be made for you. Therefore, the item that you will be receiving will not look exactly as the item in the pictures as no two hand made items can look exactly the same. I would need around ten business days to make the name plaque for you. Usually, I ship the item between one and two weeks from the day of the order. 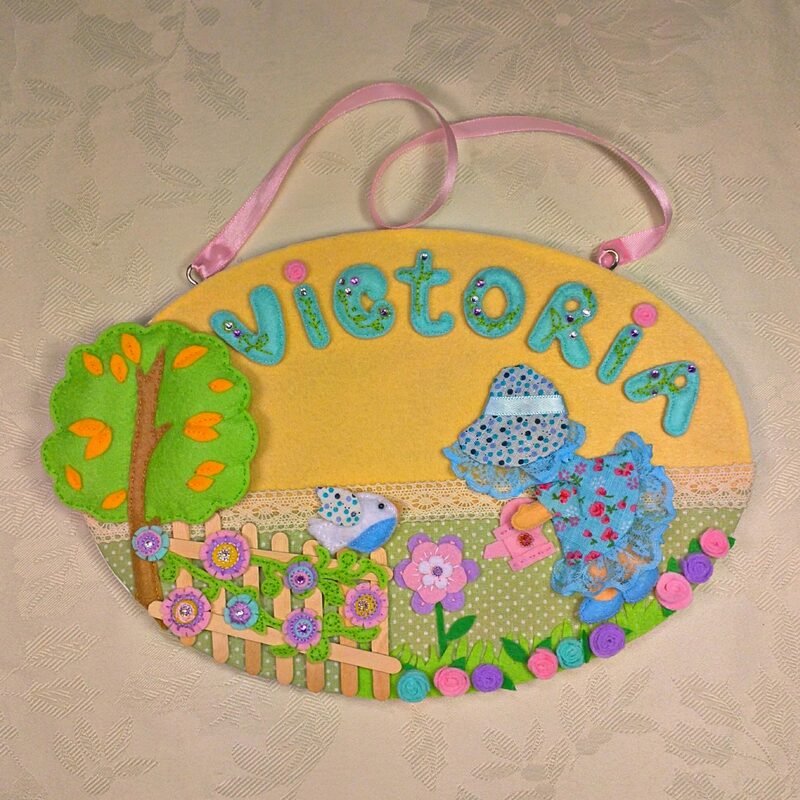 Currently, this name plaque can be purchased from my Etsy VikaCreations shop. Here is the direct link to this personalized name plaque on Etsy. This is a pics of the personalized name plaque. Warning: the image is of high quality and is very large. You might not want to open them it if you are using your mobile data plan for viewing this page.